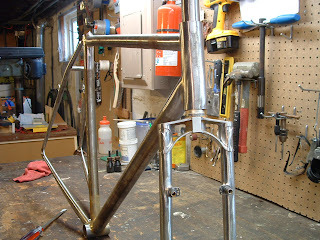 Finished up this fillet brazed frame today and it's off to Jason for paint tomorrow. Should be back in plenty of time for cross season. I almost forgot how much work finishing a fillet bb shell is. 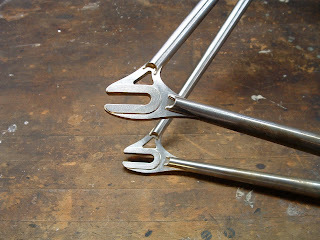 I convinced James to go with the steel fork over a carbon one. 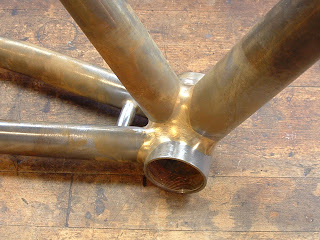 The Pacenti crown was a challenge to braze, but very stylish. 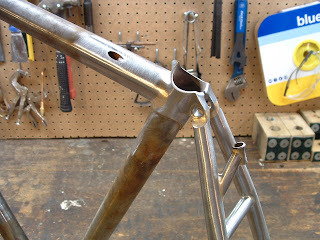 Internal top tube cable routing. Pacenti rear dropouts, clean and simple. Is the Pacenti crown used for a mountain bike? It looks like a lot of clearance for a cross bike. 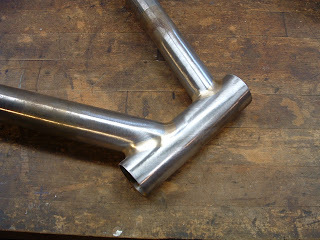 I luckily have one of the Ritchey crowns from the last MB1s built. 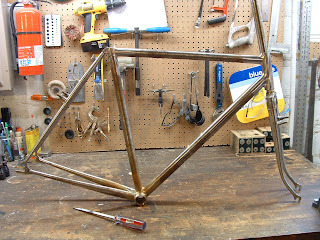 I think Kirk is working on a smaller version that crown, but I can't imagine too much clearance being a problem on a cross bike.